Anglers and conservationists committed to conserving the irreplaceable wild salmon and trout resources of Alaska’s Bristol Bay region should heed the wisdom of the late and much lamented Yogi Berra: “It ain’t over til it’s over.” The massive proposed Pebble Mine – to dig what could be the world’s largest open pit mine and excavating 10 billion tons of waste rock in the Bristol Bay headwaters – is still alive and posing a dire threat to salmon runs that topped 60 million wild fish this year. Many believed, wrongly, that the project died when the multi-national giant Anglo American mining company pulled its financial support and the United States Environmental Protection Agency proposed minimum standards to protect Bristol Bay. Yet, the Pebble Limited Partnership (PLP) is still out there seeking new backers while pushing aggressive political and legal strategies to block clean water and fish protection standards from being finalized for the pit mine and its vast artificial tailings storage lake. PLP doesn’t think “it’s over” and neither should we. Alaska’s Bristol Bay region is home to the world’s most prolific wild sockeye runs with annual runs of 20 to 55 million fish. The other four species of Pacific salmon also call home the Bay’s spectacular river and lake systems. These salmon runs are an ecological pillar supporting the world’s finest rainbow fishery – including muscular hard fighting ‘bows that top 10 pounds – as well as arctic char, Dolly Varden, and grayling. Over 35,000 fishing trips are taken to the Bay region each year sustaining a recreational fishery that provides nearly 900 jobs. This is in addition to a well-managed commercial fishery which generates over 10,000 jobs and over $1.5 billion a year in total economic output as well as a subsistence fishery for Native inhabitants that is thousands of years old. The Kvichak and Nushagak Rivers are the largest and most productive salmon river systems within Bristol Bay. The Kvichak provides a highway from Pacific waters to Iliamna Lake for millions of salmon; from the Lake the salmon – followed eagerly by rainbows, char and dollies as well as bears, bald eagles, and wolves – ascend smaller streams to spawn. Two of the best are Lower and Upper Talarik Creeks revered by anglers for regularly yielding 10 pound trophy trout. Pebble Mine proposes to dewater Upper Talarik Creek and build a massive dam above both streams creating a tailings storage impoundment for 10 billion tons of potentially acid and metal laden waste rock. Any leakage or seepage through or under the 740 foot high dam (taller than Hoover Dam) will run down these two streams into Iliamna and the Kvichak. Farther north, the Nushagak River system issues from the Alaska Range to wind west and south across the taiga and tundra to Bristol Bay. 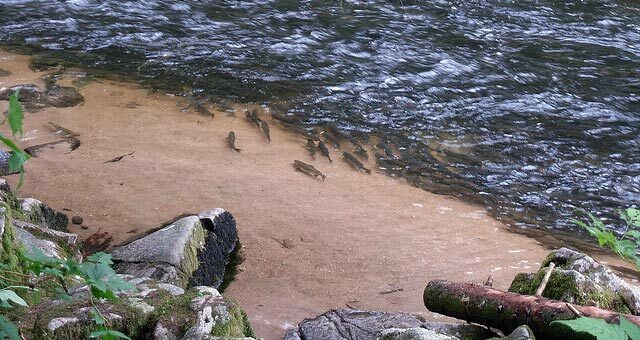 Millions of salmon – including all five species – charge up the River every year. Upstream the Koktuli River is a major tributary which finds itself in Pebble’s crosshairs. The tailings dam impoundment will also sit above the Koktuli and vast amounts of surface and groundwater will be taken from the drainage to fill the tailings lake. Enormous amounts of water are needed to keep the mine pit tailings covered otherwise exposure to air creates toxic runoff which is death to salmon and trout. Any dam failure, leakage or seepage from the north side of this tailings lake will put toxic runoff into the Koktuli and the Nushagak. And of course, this is Alaska where earthquakes are common. Despite these risks, PLP is actively seeking new partners for the mine. It is looking for another large mining company – likely a foreign entity – to decide it’s a good gamble to invest in the project given the large amount gold and copper in the low grade deposit. But if investment is a financial gamble, development is an even larger gamble putting at risk an irreplaceable wild fishery. Recent events demonstrate these risks are real. Last year a smaller tailings impoundment broke at the Mt. Polley Mine in British Columbia sending millions of gallons of polluted water into the salmon rich Fraser River. Earlier this year a water breach at the abandoned Gold King Mine in Colorado poured a million gallons of heavy metal laden sickly orange water into the Animas River. To limit these risks, Bristol Bay residents asked federal and state authorities to set clean water and fishery protection standards to ensure that any Pebble development will in fact protect the salmon and trout resources. PLP promised skeptics and opponents that there would be a mine if and only if it could be developed without putting the fisheries at risk. The proposed federal Clean Water Act terms and conditions are designed to do just that. These minimum standards provide that no more than five miles of salmon bearing streams can be destroyed and flow alterations of salmon streams cannot be reduced by more than 20 percent in more than nine miles of salmon streams; dewatering of streams like Upper Talarik or the Koktuli would be prohibited. If PLP can demonstrate that a mine can be developed consistent with these and similar fish protection requirements, it can file a mining plan and seek permits. Contrary to misleading claims, no “preemptive veto” is proposed to simply prohibit the open pit mine. However, PLP has sued to block these reasonable standards contrary to their promises to Bristol Bay’s anglers, commercial fishermen, and Native people; an action that has led to a temporary pause in permanent minimum safeguards for Bristol Bay and its people. PLP isn’t packing its bags and is forging ahead in the face of persistent local opposition. Hence it’s no time for anglers and conservationists to declare victory over Pebble Mine and sit back. We must continue to speak out for Bristol Bay’s salmon and trout and make sure political leaders – in Alaska and Washington, D.C. – hear this message loud and clear. Remember Yogi – it ain’t over til it’s over.